XL Rewards Club gives you gift cards to use for your purchases at any DXL location. Your comments are welcome: submit your XL experience at the end of the post. Enroll in the XL Rewards Club with only a valid address: no background or credit check is needed! If you also provide an email address you will be ensured to receive the most benefits from the program as soon as they are available. 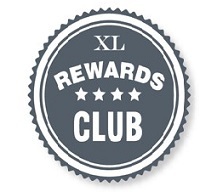 XL Rewards Club has three levels of membership: Silver, Gold and Platinum. Click here for details. Apply for your XL card here. Would you please let me know how I can access my XL Reward account online as I have been unable to find the proper website to do so. I have tried numerous times to be removed from the XL Rewards email list. I have called, emailed, unsubscribed ect. with no results. I am still receiving it on my email. Please contact who ever needs to be contacted and remove me from your mailing list.